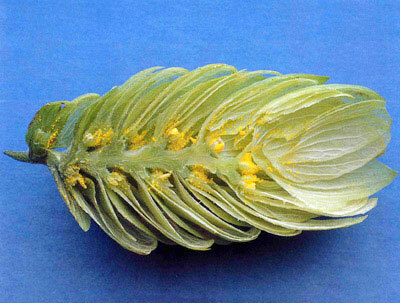 The bittering substances and essential oils are found in the lupulin which forms in the resin glands of the cone’s bracteoles. Tannins come primarily from the coarser parts of the cone, such as the strig or stem. As well as lending a particular note to the flavor, the use of hops in beer production also has an influence on the bacterial flora. It has an antiseptic and bacteriostatic effect, influencing the keeping qualities of the beer. The bittering substances are acids. They create the “crisp freshness” of the beer and improve the stability of the head. For each of these four groups there are five acids with the same basic molecular structure but different side-chains. The absolute level of the bittering acid content and the specific composition depend on the variety and weather. The distinctive hoppy aroma is composed of over 300 different components of essential oils such as myrcene, caryophyllene, humulene, geraniol, etc. The absolute and relative amounts are largely dependent on the variety, but also on annual conditions. Saazer Formenkreis varieties (including the Tettnanger) represent the group of varieties with a very delicate aroma and are primarily distinguished by their farnesene content. Tannins influence the flavor and mouthfeel of the beer. They have the effect of breaking down proteins, making the beer lighter in color and easier to keep. High levels reduce head stability.